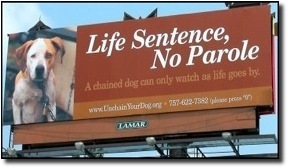 power players for animals in your town, city, county, or state. HOW THEY WORK: See Julie Lewin’s Power Point presentation on your computer and hear her voice on your phone. When you register, Julie sends you a link with a password for your computer and an access toll phone number. After the presentation, join in a discussion and question-and-answer period. "You know I support you. But face it. You're not going to win. Power in the lawmaking arena comes form an issue group's ability to influence elections. winning strong laws to protect animals requires a clear understanding of how endorsing political candidates is the key to success. All other issue groups know that true power in the lawmaking arena requires political organizations that endorse political candidates. Animal advocacy is the only issue group that lobbies through charitable organizations, squandering our efforts and opportunities to help animals. Laws you can win with political organizations are minimal compared to the laws you can win without political organizations. How animal rights and rescue advocates become power players in the lawmaking arena in your town, city, county or state by becoming political. What political organizations are and why they work. How even very small political groups win laws and force government policy on their issue, because lawmakers know that small politically organized groups often swing elections. The top priority of lawmakers is to win re-election. Only political groups can base their strategy on that fact. The most important factor that determines how lawmakers vote on your legislation is whether they fear their decision could cost them Election Day votes. The merits of the legislation are low on the list of factors that determine how a lawmaker votes on it. The merits are low on the list of factors that determines your bill's fate. How even landslide electoral victories are often determined by a very small number of votes--and how to ensure that lawmakers know your group has--and will deliver--these votes. Why your successful strategy for winning strong laws that protect animals--and their enforcement--is based on these facts. The size of your list in each lawmaker's political district reflects your potential to reward the obedient lawmaker with your votes--or punish the lawkermaker by sending those votes to his or her opponent. Recruitment must be your number one activity. When a lawmaker must choose between voting with you group or voting for big money, your political group wins. Why protests, petitions, and media rarely win a strong bill, unless they're backed by political group. When no media coverage is better than even good media coverage. Political designed petitions work wonderfully. We'll show you. To be taken seriously and to be effective in the lawmaking arena, advocates must understand the lawmaking process before they launch a legislative agenda. And understand the key role of direct political organizing. Too often, we get a great idea for a state law or local ordinance to protect animals, and mistakenly think our passion is enough. Too often, the animals pay the tragic price. We waste precious time and resources, and create a mindset of failure. The lawmaking arena is a political ecosystem. The political structure of the lawmaking body. Lawmaking is a step-by-step process. At each step of the process, a piece of proposed legislation can die from lack of action, be voted upward to the next step, be changed for better or worse ("amended"), or defeated. With a political organization, you impact each step for the outcome animals need. Lawmakers at each step know that based on their performance, your group will reward or punish them with constituent votes next Election Day. Lawmakers are campaigning for re-election the day after they're elected. The process in your town, city, county or state lawmaking body. The most important factor that determines how a lawmaker votes on your bill is your Election Day votes (as above). The merits are low on the list (as above). The second most important factor in a bill's fate concerns each lawmaker's political party and his or her position in the legislative hierarchy. The significance to your bill's fate of each lawmaker's political party affiliation and position in the hierarchy cannot be exaggerated. This impacts your recruitment strategy, concentrating on lawmakers with the most power over your bill. Lobbying: How your political organization's lobbyist (volunteer or paid) becomes a power player in the lawmaking arena, because to the lawmaker s/he represents Election Day votes in the lawmaker's district. Lobbying: Your lobbyist's five tasks. Lobbying: How your lobbyist strategizes with your political group. Lobbying: Winning lobbying techniques. Common errors committed by citizens that make or break a bill. "Change comes from power. Power comes from the organization." Power in the lawmaking arena comes from "electioneering," that is, an issue group's ability to impact the outcome of elections. Only political groups can electioneer--charities cannot. A political group signals to lawmakers that advocates of the issue are not naive or amateurs, that they understand how to wield power, that they know how to play to win. Every other issue pursues legislation through political organizations, because it works. How to start your political organization for animals in your town, city, county, or state. The structure of your political organization. The on-going tasks your political organization will perform and how to perform them. Recruitment is your number one activity. Getting and using political district maps. The different types of political organizations--what each can and cannot do legally. What papers to file to form each type of political organization and where to file them. It's so much easier than forming a charity. Political action committees can be formed in 2 days. Starting an independent political group. How existing charities form affiliated political groups. June 28 or to schedule, contact Julie at jlewin@nifaa.org. So often, town, city, and county animal shelters and animal control departments fail the frightened animals for whom they're the last resort. Indefensibly high kill rates, poor care while impounded, inadequate veterinary services and physical comfort, tepid adoption screening, exclusion of volunteers, and weak enforcement of animal cruelty and neglect laws are among the aspects that need major overhauls. This webinar provides the tools and understanding for you to compose a solid, winning strategy for reform, combining research methods, techniques for lobbying local lawmakers which are unique to local animal shelter reform, fresh new methods for galvanizing public support, and organizing politically, with next Election Day in mind. The 5 components of your winning strategy: 1) Research your local "chain of command;" 2) Research your animal control department; 3) Write your basic lobbying and organizing document; 4) Lobby decision-makers; 5) Organize public support. The "chain of command": Ultimately, budgets and decisions are made by a lawmaking body composed of individual lawmakers who want to be re-elected. Learn each step up the chain and how to approach, negotiate, and influence the players at each step. Research your local animal control department: Freedom of Information Acts (FOIA) allow you to learn the detailed mechanics of how the department functions. You must learn exactly how the department works, including staffing, job descriptions, number of animals impounded, how each animal is tracked, the disposition of each animal, funds spent on food, veterinary and other necessities, daily logs of animal control officers, and governing state laws. How to compose your basic document, incorporating your research's findings: This essential, succinct, memo-formed document will function as your recognizable public statement. It will include the individual specific problems you want reformed, explained individually, and your very specific individual demands for reform, explained individually. Lobbying decision-makers: With your basic document in hand, how to interview your local police chief and each local lawmaker individually, asking for specific, quotable responses on each item for reform in your basic document, telling them that you will include their responses in a periodic public news sheet that measures progress or lack of progress with your goals. Organizing public support: Each lawmaker's top priority is to be re-elected, so your effective strategy must be based on this fact. Use your basic document and periodic news sheet, media, and on-the-ground grassroots sign-up campaign, to organize a political lobbying group that will announce its intent to endorse local political candidates next Election season. Your group's endorsement decisions will be based on each lawmaker's performance in helping you make progress in meeting your goals. “You are making a big difference…teaching those who love animals how they can make laws better." "One thing that will stick in my mind is the information about petitions. It's nice to see HUGE numbers of signatures from all over, but the only names that matter are the voters in the lawmaker’s district. I have suspected this and it was interesting to hear that confirmed." "50% + 1...1 to 1 accountability of individual lawmaker to his or her informed constituents who vote...it's ALL local. The key is to impact voter turnout, because ordinarily so few vote who could vote. Take advantage of low voter turnout! One person does matter and a small voting bloc makes a difference." 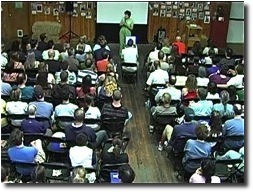 NIFAA president and trainer Julie Lewin gives training workshops, talks, lectures and other appearances around the US. Hosts may be rescue or rights groups or individuals. There is no minimum or maximum number of attendees, only people who want to learn. Events can be ½ hour to 2 days in length. Contact Julie at info@nifaa.org, jlewin@nifaa.org or 203-901-5355 to discuss. She will adapt her presentation to meet your needs. For a full workshop, ½ day to 1 day is standard. NIFAA has no funding for these events. Julie gives workshops in NIFAA’s office for 1 – 30 advocates. We’re in Guilford, Connecticut, a beautiful, historic shoreline town. A choice of accommodations is nearby. IF you understand that power comes from being political. base your lobbying strategy on this fact—on Election Day math. It’s why you must have a political group that endorses candidates. The merits and need of your legislation are low on the lists of factors that will determine its fate. Election Day math is the top factor. for a charity is not being political. ~ About local and state political groups. They are easy and quick to establish. animal legislation. Often they are a waste of time and sometimes are harmful. and the role of your political group for animals. a power player! In towns, cities or counties, you can do this while holding a job. arena comes from the “ground up.” Winning recruitment strategies. issue. How a political group achieves aggressive enforcement. ~ Animal rights and rescue charities can form affiliated political groups. Here’s how. ~ The dynamics of social change. campaigns, you understand just how the lawmaking process works.